Apple is including a Lightning to 3.5mm headphone jack adapter with the iPhone 7, but what happens when you lose yours? Apple is happy to sell you another, and it’ll cost you US$9. 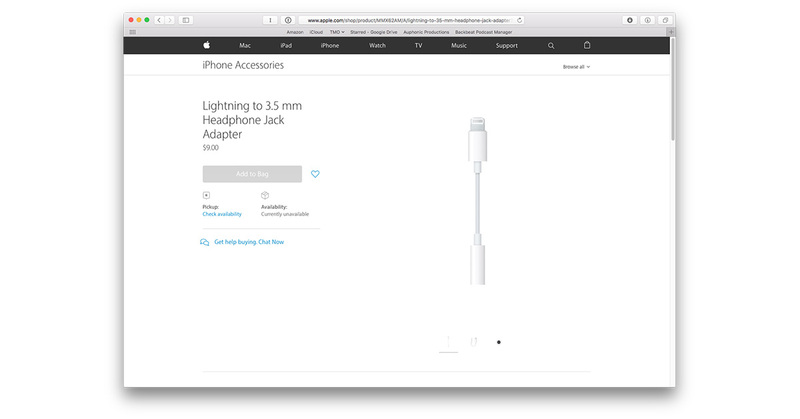 The Lightning to 3.5mm Headphone Jack Adapter is already on Apple’s website as an iPhone 7 accessory, although it’s showing as currently unavailable. Presumably that’ll change by next Friday when the iPhone 7 and iPhone 7 Plus start shipping. Apple unveiled the new iPhone 7 lineup at a media event on Wednesday where senior vice president of worldwide marketing Phil Schiller confirmed the decades-old 3.5mm headphone jack was history. Apple removed the jack to make room for other components, like the new cameras the he said are better than those in any other smartphone. iPhone 7 owners won’t be out of luck for listening to music or making phone calls because the new models include EarPods with a Lightning port connector, and they support Bluetooth earphones, just like previous iPhone models. By bundling the 3.5mm jack adapter, Apple ensured all of the headphones users already have will still work. Apple offering the adapter as an accessory purchase isn’t surprising because people will eventually need replacements or extras. The price, however, is a bit of a surprise at $9—not $19 or $29, which more in line with the company’s other basic cables. Hitting the sub $10 price point for the Lightning to 3.5mm Headphone Jack Adapter is a smart move because is says Apple isn’t going to gouge customers for an adapter to a port many think shouldn’t have been removed—although no doubt we’ll start hearing complaints about how it should cost $5 instead. Still, it’s a reasonable price and takes away some of the sting of losing or breaking one. A good article BurmaYank. I am still going to grumble about it for a while, then yell at some clouds though not iClouds which I like and use. Belken makes a solution to this completely-obvious-to-everyone-but-Apple problem. So am I the only one who charges when away from a computer? Apple needs an adapter to listen to headphones while charging. You know like the the Lightning to VGA adapter or Lightning Digital AV Adapter. Including more of them in the iPhone 7 box, or selling them for a $1, would help mollify criticism of what still many consider a boneheaded decision. I’m getting tired of paying $29 for earbuds when the connector begins to short out (I’ve tried buying lower-cost knock-off from amazon, but that turned out to be a BIG mistake).